A common question I often get is, "Should I set up a blog or a website for my online business?". The reality is, these days if you want to make money blogging there isn't much difference between a blog or a website; or which platform you choose to use for your online presence. In the past, a website was really more of a "static" online presence; meaning it served more like an online brochure and wasn't updated often. On the flip side, a blog was a site that was frequently updated with the newest posts showing in reverse chronological order. A blogging platform is a software or service that you use to publish your content on the internet in the form of a blog. A blog platform is a specific form of a content management system. Again, in the past, the software programs you would use for building a website versus the software program you would use for a blog (CMS) were completely different. These days many people will use either a website builder (like Wix.com or Web.com) or a blogging software (like WordPress). In most cases a website builder or a blogging CMS will be able to create both regular web pages and blog-type pages; so there really is a lot of overlap. The most common arrangement most websites today use is to have blogging based CMS (like WordPress) to create both the static pages on their website and also have a blog on the site which is updated regularly. With that said, not one size fits all, so let's take a deeper look at blogs versus websites. A blog differs from a typical website in a number of ways. The primary thing that distinguishes a blog from other websites is that the content that is published onto a blog is shown in reverse chronological order; meaning that the most frequent additions to the website are shown first. 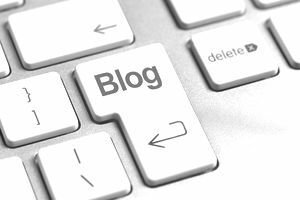 Blog posts will usually show the date that the blog post was published and have a specific author assigned to the post. Blog posts can also be assigned to specific categories, making it easier to search for all posts on a blog related to a specific category. Blog posts can also be tagged with multiple keywords; as another way to search for specific blog posts on a website. Most people will have a blog included on their website, and even use the same software to create regular website pages and blog pages. With that said, most people will end up using a blogging CMS solution to create their hybrid blog and website. I rare instances where blogging doesn't really make sense for a business, the choice of using a more traditional website builder may be a better option. There are several different companies that offer free and/or paid services for publishing and hosting a blog. The most popular free blogging platforms include WordPress, Blogger, Tumblr, Blog.com, and Medium.com. If you are just looking to create a personal journal or share information with others than a free blogging platform can work out well for you. But if you have any intent on making money online or using your blog for commercial purposes then it's highly recommended that you avoid these free blogging platforms and use a self-hosted blog using WordPress. Note: even if you are using a self-hosted blog with WordPress for your own website, you can still benefit from posting to a site like Medium.com to reach more people and have them find you. One of the most popular blogging platforms is WordPress. There are two versions of WordPress; WordPress.com which where you can have a free blog hosted with WordPress and WordPress.org where you self-host your own WordPress blog. While it may seem confusing initially; WordPress.com is similar to the free blogging platforms; where you are limited in what you can do. WordPress.org is where you get your own hosting account and install your own WordPress installation, where you have complete control over what you can do. You can also learn more about the differences between WordPress.com and WordPress.org here. As mentioned above, these days there aren't many differences between using a blogging platform or website platform for your website. Most website platforms allow for you to have a blog included and most blogging platforms have the ability to make regular website pages. I recommend building your website/blog using WordPress, though there are other options you should be aware of. Keep in mind, the only downside to these website builders is less ability to customize your site and fewer integrations with other third-party platforms. If the technical aspects of using a platform like WordPress are beyond your capability then you may consider outsourcing your website to a competent developer; as there are many cost-effective providers who are familiar with using the WordPress platform. As mentioned above, a very popular option for blogging is using the WordPress platform, which you would host on your own website. When selecting a hosting account you'll want to go with a web hosting provider that supports free installations of WordPress. Bluehost is a popular choice for many people. Blogging (adding new content to your website) on a regular basis is a great way to get ranked in the search engines and get free traffic from people who are looking for information related to your topic. The key to getting free traffic from the search engines is to publish good quality, original content on a regular basis. You'll wan to do some keyword research to find what topics people are looking for. One of the advantages of using a blogging platform is that it makes optimizing your blog for the search engines easy to do. Most blogging platforms will have fields for you to include what's referred to as "meta data" which helps tell the search engines what your website is about. This information usually includes a title for your page, an description of your post, and some related keywords. No matter what platform you decide to use to build your website, you'll want to make sure that there is a blogging function built into the program so you can add regular content to your website. As mentioned above , when it comes to many free blogging platforms, you are only allowed to use your blog for personal use and not allowed to use it for business purposes. If you plan on making money with your blog you'll want to be sure you're using a blog that allows commercial use or simply self-host your blog on your own hosting account as mentioned above. There are many ways to use a blog to make money online. You can sell e-books online, promote other people's products and make money as an affiliate, or use your blog to promote your own products and services.